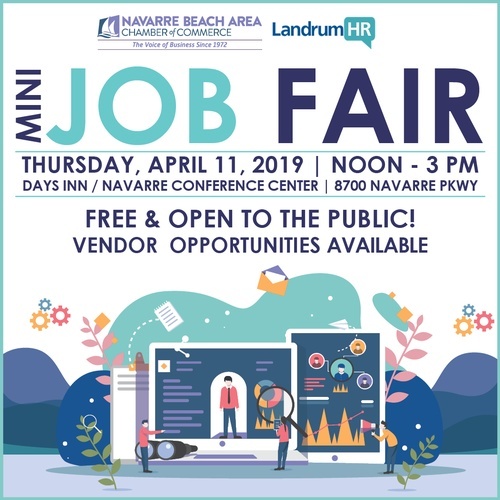 The Navarre Chamber and Landrum HR are proud to co-host a Mini Job Fair on Thursday, April 11, 2019 from Noon to 3 pm at the Days Inn/Navarre Conference Center. This is a free event and open to the public. There is LIMITED booth space available for any business seeking employees in the Navarre area, and will be a terrific opportunity to meet with many excellent potential employees. Booth space will be reserved on a first come-first serve basis, and registration & fee must be received no later than Noon on Friday, April 5, 2019. To reserve a booth, please contact: Chanda.Ryan@NavarreChamber.com. There is LIMITED booth space available and will be reserved on a first come-first served basis. CLICK HERE TO REGISTER FOR A BOOTH SPACE.